I have a few purchases left to make, but right now my gear list is pretty solid. Pack weight is at 13 pounds, and that includes a one-pound fudge factor for things like ChapStick, extra clothes added at the last minute, the weight of my pen, money, and other trinkets. 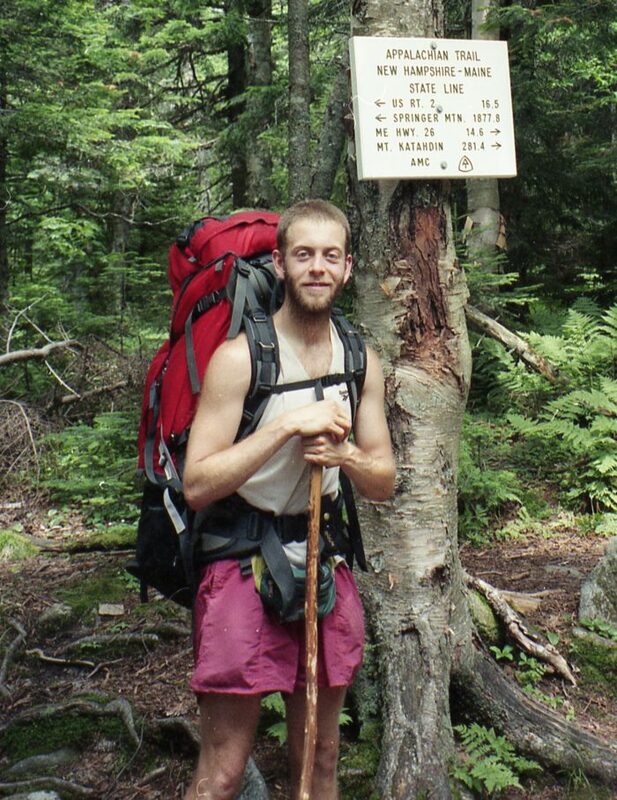 As I mentioned in my other post, when I started at Katahdin in 1997 my big four weighed 18 pounds. 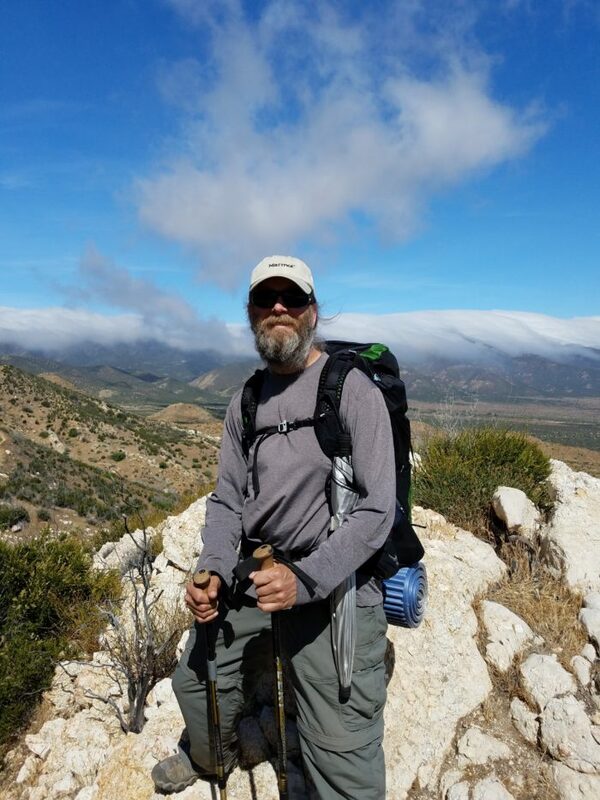 Adding in a stainless steel pot that weighed one pound, my trusty MSR Whisperlite, two liters of fuel, sweatpants, a flannel shirt, extra clothes, rain gear, and enough canned food and fresh vegetables to last the 100-Mile Wilderness, the total weight was around 70 pounds. The pack felt as big as I was. In 1997, at mile 281, still easily 50 pounds on my back. I still have the walking stick. Fast forward 20 years, and except for my compass, everything is new. –Big Agnes Fly Creek HV UL2 In fast-pack mode I carry the fly and poles, and use a home-brew setup made from string for a footprint. In 2017, a daintier pack, probably here around 25 pounds loaded, and a more Leave No Trace friendly outfit. –Chrome Dome umbrella. Because life is better under the Dome. The trick is flexibility and adaptability. For instance, in the Sierra and northward, I need the ability to keep bugs out of where I’m sleeping. For that, I’ll add the actual tent part instead of just the fly. Many hikers opt for either a tarp or a high-end ultralight tent, but a tent where you add the floor separately. By the time you buy and assemble all that, you have… a tent. I’m happy to swap out the sleeping bag for a quilt, as I tend to toss and turn, and always end up face-first in my mummy bag. Plus, in warm weather, it’s a quilt anyway. I used to carry a silk liner, but I found that I got tangled up in it, and if you change over into your thermals for sleeping you keep the same level of warmth. I’m going with an inflatable pad this time around. I had a gift card for it, it’s more insulating, packs smaller, and is lighter than my good old foam Ridgerest. The only thing I worry about is puncturing it. Also, the Ridgerest was a handy seat, and bulletproof. We’ll see how this goes. On the pack front, I’m sticking with the old Exos because it fits me, holds a bear can sideways, and I own it. But I’m leaving the lid/brain home, saving 4.5 ounces. At 61L, the pack is more than big enough, and having the big brain on top just encourages you to fill it, which I find unbalances the pack. Many people don’t carry a compass, or paper maps, instead trusting to the obvious well-worn trail, their phones, and the presence of other hikers. I prefer to have paper maps so I can see where I am, where I’m going, and plan my days. While you can use the sun and stars to navigate, especially in the desert, I carry the compass for certainty. This year I’m bringing a smaller battery pack, weighing just a hair over four ounces, instead of the bigger 10050 mAh battery I brought last year, weighing almost 8.5 ounces. It will bring my phone from one percent battery to 93 percent. Since my phone will go three to four days on airplane mode with camera use and not too often checking Halfmile or email, my total endurance is seven, maybe eight days. I think I’ll get the additional battery when I hit the Sierra – not the best time to add weight, but since it’s also the battery pack to recharge my headlamp, better safe than sorry. I’ve thought about going solar, but the weight and fiddliness is just too much to deal with. –Get up, eat Pop-Tarts and peanut butter, place two packs oatmeal in peanut butter jar half full of water. –When the sun rises above the brim of your baseball hat, stop and have second breakfast – the soaked oatmeal. By then you need water anyway. –Eat lunch: tortillas, cheese, fruit, maybe an avocado. –Afternoon snack break. Load the PB jar with dinner, i.e. Lipton pasta with TVP bits added, and fill with water. –Break for dinner, eat soaked pasta. There’s nothing magical about this gear list, except it is mine. It fits, I like it, and I know its capabilities. There are plenty of gear lists out there that you can copy, grab your credit card, buy, and you’ll probably do OK. Know your gear, know what it does, and trust it. When you whittle down individual pieces to their bare essentials, and skip the things you don’t need, everything fits like a second skin. Then you can get down to business and enjoy yourself. The real point is not to geek out about pack weight and calorie density; the real point is to be out enjoying yourself and experiencing things. When your equipment stays out of the way, you know you’re in a good place. When you have 2 gallons of water on your back along with all your other stuff, sometimes you feel like that guy! Boy, how times have changed for the lighter.